Could anyone please help out with what's wrong with the icon path in the groups "Go.ActionGroup" and "Go.Tools"? I've read the documentation from http://confluence.jetbrains.com/display/IDEADEV/Work+with+Icons+and+Images and I'm simply not sure if this is a bug in IDEA and I should report it in YouTrak or I simply failed to read the documentation properly. I think this happens because the icon is being loaded from the classloader used by the action or action group class. 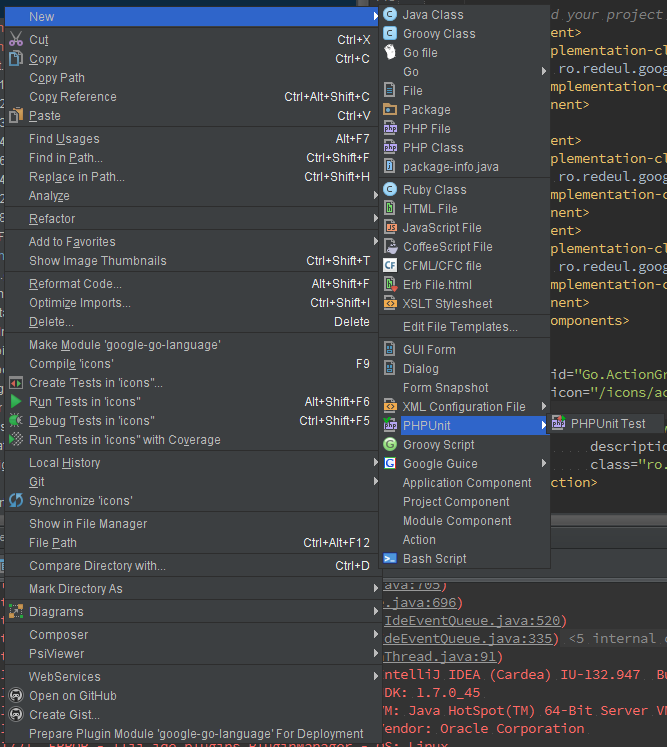 The group in this case is DefaultActionGroup, which is loaded from the main IntelliJ IDEA classloader, which doesn't have access to any of the plugins' icons. If you really want to have an icon for the action group (which, again, would be inconsistent with the UI of the rest of the product), you can define your own ActionGroup class that extends DefaultActionGroup. Thanks for reply Dmitry. Is there any place where to read such a guideline as I might have skipped it? And if it is, can you make it more visible please? Also, I think that the original icon should have been placed for the Go group like it is for PHPUnit or Google Guice for example, see the screenshot. Same goes for the Tools entry.